Nottingham, UK: Copley Scientific, the world’s leading manufacturer of inhaler test equipment, presented its new 3rd generation Critical Flow Controller—the TPK™ 2100—for the testing of dry powder inhalers (DPIs) at the 2017 Drug Delivery to the Lungs conference (DDL2017) in Edinburgh. Now in its 27th year, DDL is the premier annual event for researchers in the field. The company showcased this latest TPK™ model at DDL to highlight a series of new capabilities, all intended to make dry powder inhaler testing more automated, more reproducible, and more efficient. More than 700 delegates and 90 industry sponsors were expected for the 3-day meeting, which featured discussions on industry hot topics as diverse as the lessons formulators can learn from new e-cigarettes, as well as a regulatory update presentation from the European Medicines Agency (EMA). The newly introduced TPK™ 2100 builds on Copley’s heritage of TPK™ models, an international standard in the field of DPI testing equipment, and is ideally suited to the needs of formulators and quality control scientists. It sets a new benchmark for the set-up, control, and documentation of all the parameters associated with the measurement of delivered dose uniformity and aerodynamic particle size distribution (APSD) by cascade impaction, in accordance with the United States and European Pharmacopoeias. Designed to replace the well-established TPK™ 2000, significant new features are built into the TPK™ 2100. A new ‘flyby- wire’ flow control valve allows operation to be automated. Inhaler pressure drop, P1, and test flow rate are accurately and rapidly set by the TPK™ 2100 during test set-up, whilst in-line flow measurement can be accommodated and in-situ impactor leak testing is fully automated for the first time. The user is warned if the important P3/P2 ratio is greater than 0.5, giving full confidence that tests are conducted under sonic flow conditions, whilst notification is also given if the set flow rate and impactor leak rate are outside acceptance limits. Test duration is automatically calculated based on the required test volume, and the new model offers an optional footswitch and temperature/humidity module. Data output to printer and computer are standard, with enhanced monitoring and five different reports covering critical intest parameters, whilst remote control via USB allows the TPK™ 2100 to be integrated into larger automated systems, where required. Finally, the new instrument allows users to emulate the previous generations of TPK™, promoting interchangeability and integration into existing standard operating procedures (SOPs). A new TPK™ 2100-R is also being launched. This is a reversed version where the flow inlet and outlets are swapped over to allow different arrangements of testing equipment to be set up on the laboratory bench. Experts from Copley Scientific were on hand throughout DDL2017 to discuss any aspect of inhaler testing. To find out more about the TPK™ 2100 or the company’s complete portfolio of equipment for inhaled drug testing, contact Copley Scientific at: sales@copleyscientific.co.uk or download ‘Quality Solutions for Inhaled Testing’ from: http://www.copleyscientific.com/downloads/brochures. 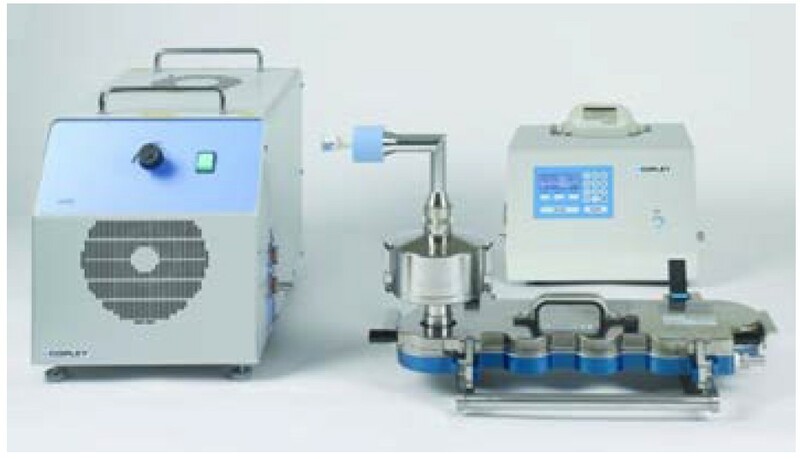 Next Generation Impactor (NGI) system for Dry Powder Inhaler (DPI) testing, including the new TPK™ 2100.